She was one of the kookiest, quirkiest teachers I ever had. (Pro Tip: And also one of the most beloved.) She crafted music shows in which her students sang and danced to the Beatles and Billy Joel and loved doing it. And on a miserably muggy day, she showed us how to keep cool: fake it. We all practiced shivering. We all said, “Brrrrrr.” And, you know what? It almost worked for a minute. This town of 106 is just south of Saint James. It’s home to the Odin Craft Mill–a wonderful event that runs twice a year and is probably a lot more fun if you don’t bring your very active daughter. If you do bring her, you should at least avoid giving her a wooden magic wand and then taking her to the Christmas ornament room. Not that I am speaking from personal experience at all. Odin Grocery and Cafe, 2015. You know you’re in rural Minnesota when . . . The name of the coffee and sandwich shop is a dairy-related pun. As you may know, I love puns. And coffee. And sandwiches. So, it’s no surprise that Calf Fiend Cafe in Redwood Falls is my new favorite place for lunch. A friend and I stopped there yesterday on our way to a meeting. It was our first visit (RWF is an hour and a half from Litch), but we immediately fell in love with the place. The homemade bread (molasses multi grain yesterday). The friendly server (and bread baker) with the finely waxed handlebar mustache. The giant paper mache calf cavorting in front of the pastry case. The homemade bread. (Seriously, it was so good we bought extra to take home instead of having dessert. Although, full disclosure: when I say “instead of dessert”, I of course mean, “instead of having a cookie and the Dairy Queen treats we had on the way home from the meeting). Truly, the Calf Fiend Cafe is a gem. If you are a Minnesota reader, you should go there. In fact, call me up and we can go together. We can hit Ramsey Park to see the Falls and the zoo, and maybe the aquatic center after lunch. It will be calffiendtastic. What’s your favorite place for lunch? P.S. I borrowed these photos from Calf Fiend Cafe’s Facebook page. Visit them there and see a few more! 1. Mosquitoes the size of Buicks roam freely. 2. Wal-Mart is sold out of the Benadryl Itch Relief Stick, the only product your daughter will accept to soothe her golf-ball-sized mosquito bites. 3. 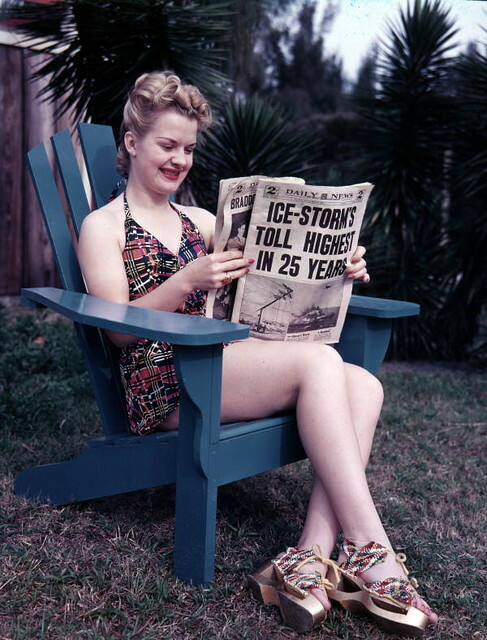 Instead, soothe that mosquito-inflicted pain at any number of Pie and Ice Cream Socials. 4. Because you were outside in the evening eating pie and ice cream, return to step one. Repeat as needed until the crickets sing and fall arrives. How do you know it’s summer where you are? No, not the one in Minneapolis. The one in Hutchinson! 1. If people are still in line for tickets or concessions, they start the movie a minute or two late. 2. If you ask for a cup so your preschooler can have something to put her M&M’s in, they are happy to give you one. 3. If you bring a two-and-a-half year old to the movies, they ask how old she is and let her in for free because the kids’ tickets are for ages three to twelve. 4. If your preschooler is asking for animal crackers on the ride to the theater, they are miraculously available at the concession stand, and they cost eighty cents. 5. If your preschooler decides M&M’s and popcorn are what she would prefer, you can get plenty of both for five dollars. Is it the fanciest theater in town? No. Is it the perfect place to take a small child? Absolutely. It’s not too loud, or too crowded, or too overwhelming. It is, in fact, just the place to be at 5 PM on Super Bowl Sunday, watching The Muppets with your family and the eight other people who thought that would be more entertaining than watching the Giants and the Patriots. Zoe far exceeded my expectations and my anticipation. 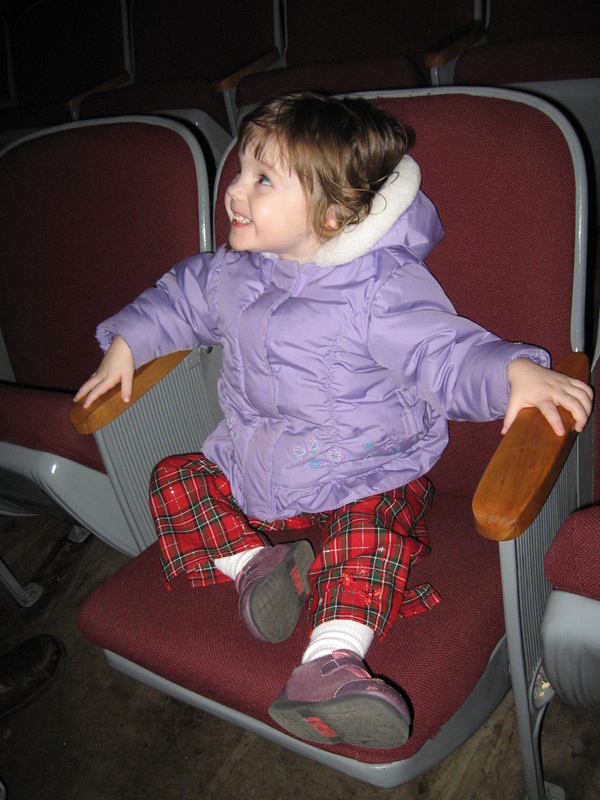 She watched most of the movie, refrained from crawling around on the floor, and only kicked the (empty) seat in front of us a few times. When we got in the car, she immediately started singing “Mahna Mahna”. We sang it together all the way home. Taffy Apple Salad. Click the photo for a recipe (which I can't vouch for, since I've never actually made the stuff). Last winter I was talking with another rural Minnesota pastor, a Seattle native who had been mysteriously assigned to Southwestern Minnesota. He served faithfully, but was never quite at home. Filled with hope, the pastor looked around. “Salads? Where are the salads?” He looked in vain for a table filled with leafy greens and fresh vegetables or fruit. But alas. 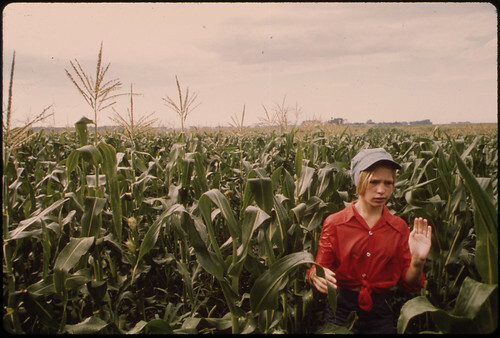 Because this was rural Minnesota, she was talking about . . . the Other Kind of Salad. Taffy apple salad. Jello salad. Frog Eye Salad. Chinese salad. Cheese salad. These are a few of the delicacies I imagine the pastor saw that fall afternoon. He was most definitely a salad guy, but not the kind of salad usually on offer in this part of the world. Oh, sure. 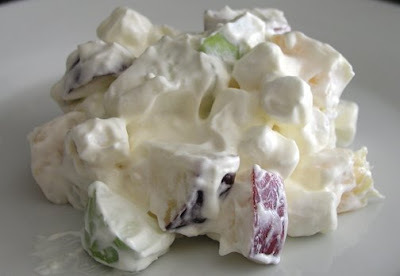 You will sometimes see a green salad, or maybe a fruit salad (but “fruit salad” means canned fruit and cool whip–the kind you might be thinking of is a fresh fruit salad). But it’s in my nearly two-and-a-half years of small town Minnesota residency that I have come to truly embrace the Salad in its many amazing forms. Maybe it’s because as a vegetarian, the salads are usually a place of refuge for me. Maybe it’s just because familiarity breeds, not contempt, but fondness. Or maybe it’s because taffy apple salad tastes exactly like taffy apples, but is called a salad. So it’s clearly healthy. Right? What’s your favorite salad or potluck delicacy? 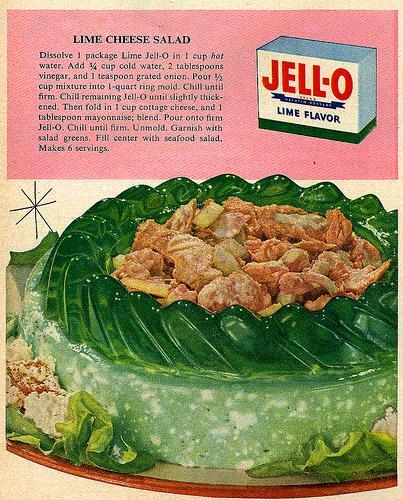 NOT the kind of jello salad I have grown to love. As a high school and college student, one of the qualities I looked for in a potential future mate was: someone who would eat the pickles that came with my restaurant meals. (Pro Tip: This was not my top criterion, but it was perhaps my most whimsical.) I was just not a pickle person. Now, I still give those restaurant pickles away most of the time (to my actual mate or to whomever would like them), but the reason is different: I am now a pickle connoisseur. Plus the bread and butter pickles in the fridge; minus the amazing garlic pickles I finished the other day. What made me a pickle fan? I think it was moving to rural Minnesota, where the relish tray is a required item at all potlucks, parties, and festive meals. Also, homemade pickles are delicious. Sweet pickles (which, in fact, I have liked for quite a while), garlic pickles, bread and butter pickles, mustard pickles. Yes, please. 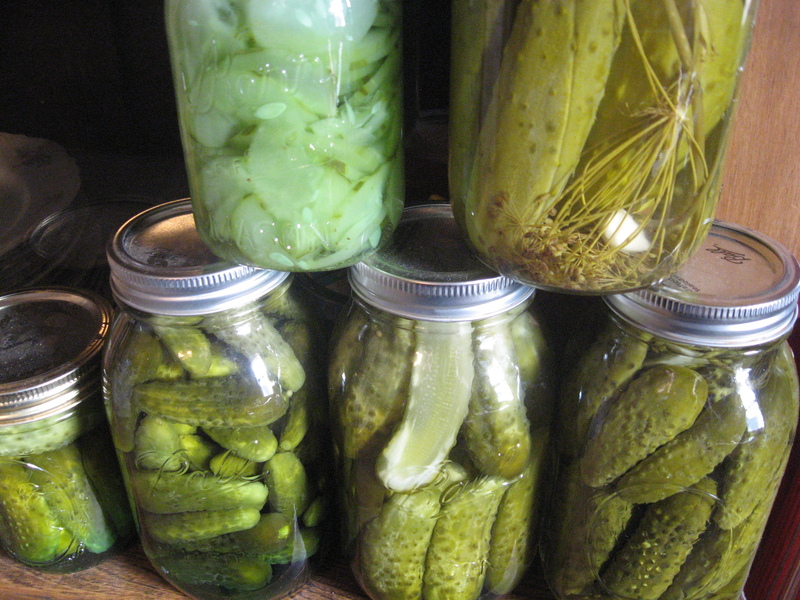 So, if you are already a pickle fan, hooray! And if you are not, consider sampling some the next time you get to a farmers market or a rural Minnesota potluck (or my house!). And if you are still not a pickle fan, please enjoy one of my favorite Arlo Guthrie songs. He doesn’t want a pickle, either. I am a pastor of one wonderful Lutheran church and a parent of two wonderful children. I live in St. James, Minnesota with my husband Mike and my children Zoe and Leo. I started this blog to share my adventures pastoring and parenting in small town / rural Minnesota. Thanks for stopping!